Linckia spp., Protoreastor (Choc. Chips, <African> Red General), most large stars period... don't generally live in captivity for any time... due to rough handling, starvation enroute, genetic predisposition to tolerance of captive conditions. LOOK for better species. with 2- Red Knobby Star Fish, 2-Orange Clown Fish, and 2-Black/white clown fish. All water conditions test normal. I have had the inhabitants for over a month now. I feed the star fish a combination of a omnivorous formula and a frozen brine shrimp formula. I usually place the food in the sand and place the star fish on top of it. They seem to be eating fine. However, they have been acting odd. They seem to curl up their arms so the tips are pointing upwards or at times seem to twist their body in odd shapes. Normally they move around the tank quite quickly, however one of them wedges itself under a piece of live rock for long periods of time. I have one that curled one leg up and I could see a white flesh colored substance under its leg. Thought it may be some of the shrimp food still lingering on its leg, but because it has been acting so odd, I was concerned it may be a disease. I wasn't sure if I should remove it or just monitor it? I'm not sure the best treatment for these specific star fish. In addition, they at times seem to almost shrink in size. They have been so entertaining and seem to do so well, I hate to see them stressed or sick. What do you recommend? I have sent a few pictures. The picture with the two of them in it shows them when I first got them in the tank. They are a good size and seem to be plump. The other pics are taken today. They have been set on the shrimp. As you look at the one, his arms are pointing up and curling itself backwards and they don't seem as plump as they have been. The last picture is tough to see, but it is moving along the bottom, but the one arm is turned and is almost being pulled under it. I hope the pics help. Hello, my name is Scott. I have a 60 gallon tank that has been set up n running smoothly for a year now. 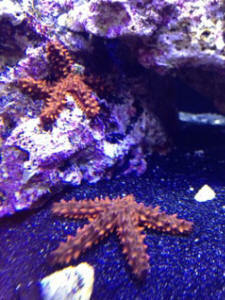 Two weeks ago I introduced an African Red Knobbed Starfish to my tank. This morning I woke up and the star had big open sores all over its body. The knobs are all falling off and the star is now very lethargic and even just falls off the glass and goes limp for a bit. What should I do? There are no other problems in the tank. I have no crabs or fish that would pick at it. Can the star be saved? Should I leave it in there or quarantine it? Thanks in advance for any help or advice you may be able to offer. I have a red sea starfish for about 1 month now. The first couple of days I noticed the tips of 2 legs fell off. Now all 5 tips are gone. It doesn't seem to move around very much, just sticks on the glass. Any suggestions. All other creatures in tank are fine, 100 gallon about 4 months old , live rock was in for while before added fish. Water tested 3 weeks ago great. I was hoping you guys can help me with my African red star fish. I just started my 90 gallon tank 3 months ago and things have been pretty successful thus far. The last couple of days I have noticed changes in my starfish's behavior, which I have had for about a month. NO3 is 1, SG is 1.023.
behaving differently he might be hungry. one located towards his core. I noticed that my purple lobster was out (which is rare for him...he usually stays hidden), but not near the starfish. Could the lobster be picking at him? Today the starfish has laid in the sand belly up. He is alive, but not moving. down. We called our LFS and they said he might be "playing dead" if something is picking at him and that this behavior can persist for about a week. Is that a possibility? Any suggestions as to what might be bothering my starfish? I do not have a QT, but with his behavior am thinking about setting one up as soon as possible. Any help or guidance will help. Alkali 300, and PH about 8.4. Two days ago I added a Fiji Rock, 1 blenny and the CCS fish. The star moved around to the back of rocks and hid there and had not moved. Today I tried to move him and he was hard as rock. So I assumed he was dead. While removing him he had some white film coming off the top. Do you really think he was dead or should I have done something else? The fish store told me my water was fine. and I hope I acclimated him right. Unfortunately he hasn't moved from where I dropped him in. I used the drip method of almost 2 hours. He's still red, but a little stiff to the touch. I read in one place that the starfish can remain in one place for up to 3 days. What are they like when no longer alive? Do they change colors? Hi and thanks so much for your helpful website! I could really use your advice please. Our red general starfish has white patches on 1 of his legs on each side of the suckers (that are in the middle of his leg). It's like the pigment is gone. He is still eating and moving around. but we have had him for about 4/5 months. so was well rested after transport and health when I got him. Over the last week or two he has started to have a problem with his leg. It started with a small tear in his skin and bits that look like white tic tack mints are coming out and it seems to be getting worse each day. I am not sure if he splitting to reproduce, the little 'mint' are star fish seeds / eggs or something else is wrong. Is there anything I can do - such as put him in a bowl with antibiotics or leave him and hope. If he is dying then do I wait until he moves to the great reef in the sky or will he start to damage / infect rest of tank / reef? If he has to come out of the tank now - I don't have an isolation tank so how would I put him down quickly and as painlessly as possible. Internal Jewel filer set up with contained heater. T5 lights (one white , one blue) - timer controlled 9:00 a.m. to 10:30 p.m.
Water change 18 to 20 litres at least once a week - when reading are high an extra 10/12 litre bucket mid week. I see that you have helped so many people with their aqua lives. It is a great treasure that we're able to keep these items away from their salty ocean homes and inside our miniature sewage systems. Thanks for teaching and helping us clean up after ourselves. I've run into a predicament. I have a Chocolate Chip Starfish that is pretty active. She walks around my 80 gallon FOWLR tank, and I've kept her happy for a couple of months. However, a spot has developed on her backside. I am guessing it is some type of parasite, although I have no expertise. She still eats fine. My question is, do you know what this cyst is? Is it cancer? Is it contagious to the other fish in my tank? Did she catch it from the other fish in my tank? Should I remove her immediately into quarantine? Would you recommend that I treat her with any medications? <Would not treat with any medications, but continue to observe the starfish along with maintaining regular feedings. These starfish do much better in systems with high water quality. Do concentrate on this aspect. Poor water quality could lead to a heterotrophic bacterial infection, and this could be a possibility. Dosing weekly with an iodine supplement may be beneficial in this regard. Do read here for more information. Thanks so much James (Salty Dog ??)~~~!! I've run into a predicament. I have a Chocolate Chip Starfish that is pretty active. She walks around my 80 gallon FOWLR tank, and I've kept her happy for a couple of months. However, a spot has developed on her backside. I am guessing it is some type of parasite, although I have no expertise. My question is, do you know what this cyst is? Is it contagious to the other fish in my tank? Did she catch it from the other fish in my tank? Any advice would be greatly appreciated. Truly yours, Sally. Sick red African Star, also dwarf lionfish tankmate meals RMF's go 7/27/06 Hello Bob, <Hosh> I love your book and your wonderful website. You guys are keeping my fish alive! <Actually you are... am glad we can/help you> Here are a few questions for you'¦ I have a two months old (relatively new) 55G reef setup and green and brown algae are starting to form. So I ran out and got a sea star to clean the tank. <Mmm... Asteroids are not really "algae eaters"> It turned out to be an (Protoreastor lincki) African or Horned Sea Star, which I don't know if it is reef safe. <... Is not... and inappropriate for this sized system> I guess I may not have gone though the acclimation procedures long enough (30 min) when I put him in the tank. A few minutes after it went in, clear, slimy strings start to floats around it. The body goes from being totally smooth to slight sandpapery in texture. Although he changes shaped a little bit, he hasn't moved since I put him in the tank last night. <Echinoderms don't "like" chemical, physical changes in their world> I also tested the water in the bag after the fact, and it is at SG .018 and my tank water is at .023. <Yeeikes> Is it too drastic of a change for him? <Oh, yes> Although it is not moving, I can still see some wiggling tube feet coming out at the bottom of the star. Is he going to make it? <Doubtful for long here> My existing serpent star is doing great! 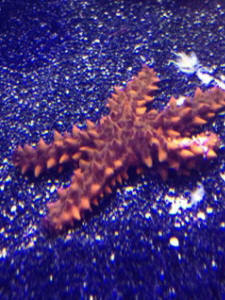 Which sea star is right for cleaning algae in a reef tank? <None> Secondly, I have a 5' dwarf fuzzy lionfish (my sea puppy) which I just love. He is well fed (he eats anything I put in front of him) and doing very well except for a slightly clouded eye on one side. He never hides, always out in the open (day and night) playing power head surfing by zooming across the tank. Here is the problem; some of my other fish (over half its size) are disappearing one after another overnight. <Inhaled likely by this Lion> Two maroon clowns and three damsels, along with a 3' royal Gramma. There is no evident that they ever get sick and died and turned into hermit crabs lunch. Yet, I can't be sure (and refuse to believe) that my cute little lionfish could have eaten all these good sized fish. <Did do so most likely> I have found nothing on the floor. Power head and filters are free of fish filets. Are we looking at a possible case of UFO fish abductions? <Heeee! Just bigger, faster tankmates. Bob Fenner> Thanks for your help! Oops, One more thing...RE: Blue Linckia Starfish >It has been behind the rock for just over one week. Thanks! >>You're welcome!